Little by little, New Yorkers are being given the opportunity to see and explore the work of the late Belgian artist Marcel Broodthaers. 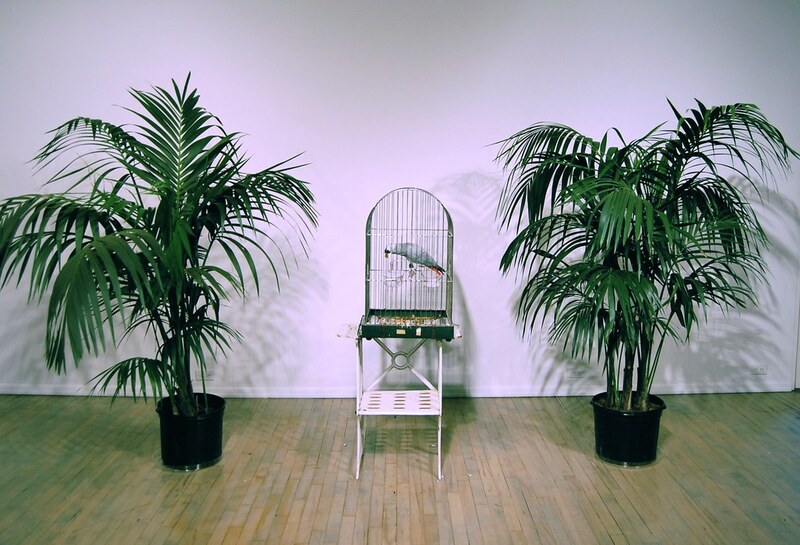 Last year, Peter Freeman showed Ne dites pas que je ne l'ai pas dit (1974), which was first displayed at the Wide White Space gallery’s Antwerp location and includes a live parrot (an African Grey Parrot, to be exact) and two palm trees (pictured below). 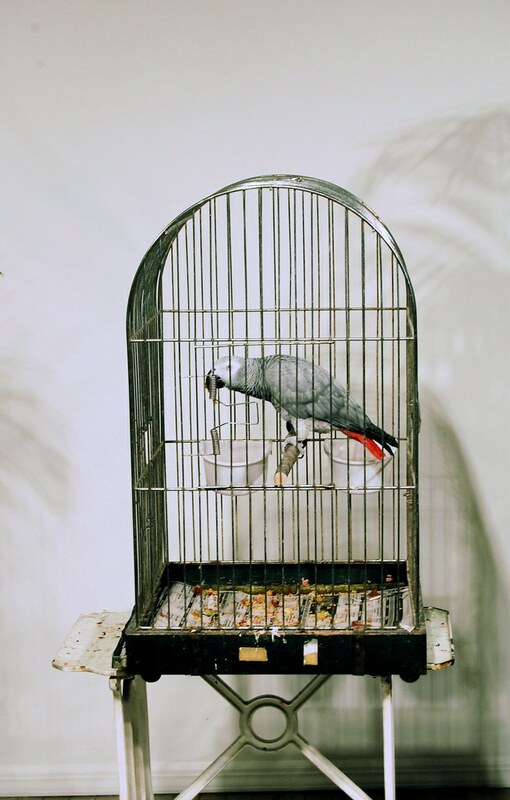 The parrot was completely and sadly silent when I visited, but, according to the New York Times, that was not unusual: she only spoke when the gallery was empty of visitors. As Freeman noted in his press release, shortly after installing his Wide White Space show, Broodthaers moved on to the Kunstmuseum Basel, where he debuted Dites partout que je l'ai dit, now on view in Michael Werner Gallery’s “Marcel Broodthaers: Major Works” exhibition. There is a parrot here, too, though it is quiet this time because it is dead: stuff and placed under a bell jar. Broodthaers famously became an artist at the age of 40 (he had been a poet previously), and died 12 years later of liver failure in 1976. 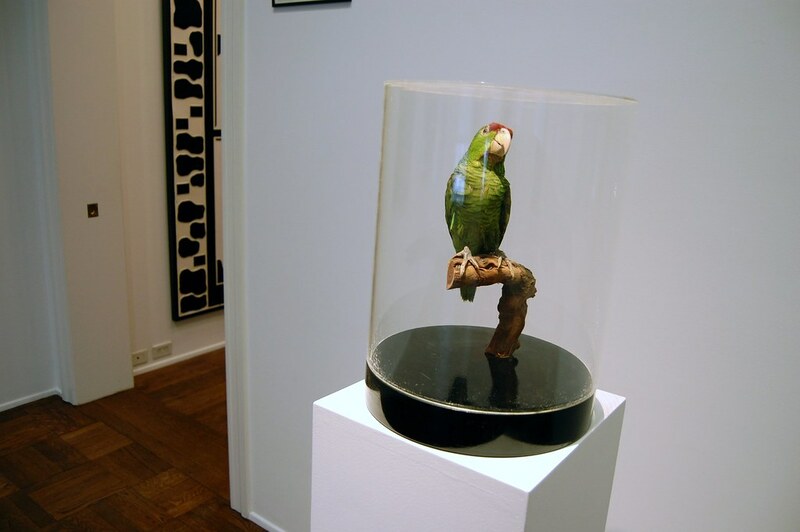 In that short time he built a career in miniature, moving quickly from making almost sardonically vital art (a live parrot) to artworks in the form of prepackaged retrospectives (a parrot under a glass jar). Even 35 years after his death, Broodthaers’ art is still hard to work out, not quite easily integrated into any history of recent contemporary art. As New Yorker critic Peter Schjeldahl noted in his 2004 profile of gallerist Marian Goodman (who started her gallery in 1970s with the express purpose of showing Broodthaers’ work), his “twisty, cerebral art — including elegant installations of, say, common objects in vitrines, eighteenth-century engravings, ironic texts, and the odd palm tree, concerned with protocols and politics of exhibition — is still a hard sell in America.” Goodman’s current show, focused on the Section Cinéma (1972) of Broodthaers’ sprawling Musée d’ Art Moderne, Département des Aigles project, should help change that. Though it includes no parrots, it presents the Broodthaers' comic, elegiac short films alongside his haunting installations, and it makes a strong case that it is time for New York and its young artists to embrace him.